Consumers arent just worried about lead in their childrens toys -- and their pets toys -- this holiday season. Theyre also worried about lead in their Christmas decorations. Consider this warning Cathy R. of Sickleville, New Jersey found on a box of Christmas lights she recently purchased at Target: Handling the coated electrical wire on this product exposes you to LEAD, a chemical known to the State of California to cause birth defects or other reproductive harm. Wash hands after use. Cathy is shocked that Target would sell tainted merchandise. Normally children help when putting decorations up, which not only would expose the adults, but the children to lead, she told us. I am appalled that Target or any other store would sell such products. In this day and age with all the recalled items from China that contain lead, I can't believe that any store -- especially Target under their own brand -- would put these out for consumers. A Colorado parent echoes those concerns. He found that same warning on a box of Christmas tree lights, which he also purchased at Target. We were about to poison our kids because of the products that Target placed on the companys shelf, wrote Dave of Delta, Colorado. He has two young children ages three and four. I feel like they don't give a rip for my safety or my little kids' safety, he said. They poisoned our home. But a spokeswoman for Target said customer safety is the companys top priority. We work closely with the appropriate government agencies to ensure were providing the best products -- in terms of safety and quality for our guests, said the companys Anne Rodgers. Rodgers said Target is required -- under California's Proposition 65 to place the warning label on the lights. That law, she said, requires manufacturers to notify consumers of certain chemicals present in products sold in California. The label simply indicates that certain chemicals may be present but exist in low amounts, which are below Federal safety limits, Rodgers said. Products with the label do in fact meet all applicable product safety requirements. Rodgers said Target places the required warning labels on products sold nationwide not just in the Golden State. It is more cost and time efficient than labeling only boxes sold in California, she said. Target, however, isnt the only company whose Christmas lights contain lead. Manufacturers say lead is part of the polyvinyl chloride (PVC) insulation around the wiring on Christmas lights. They also say lead is legally used to stabilize PVC so it doesnt crack or crumble with age. Lead also acts as a fire retardant. But a recent CNN investigation discovered four brands of Christmas lights contained high levels of lead -- enough to pose a threat to children. CNN hired New Jersey-based Quantex Laboratories to analyze the following brands of Christmas lights for lead: Wal-Mart, GE, Sylvania, and Philips. Quantex followed the Consumer Product Safety Commissions (CPSC) standard wipe test for lead in PVC products. Those tests revealed the surface lead levels on all four brands of lights exceeded the CPSCs recommended childrens limit of 15 micrograms, CNN reported.  Wal-Marts brand of lights contained the highest levels of surface lead -- ranging from 86.6 to 132.7 micrograms.  GEs lights had surface lead levels from 68 to 109.1 micrograms.  Sylvanias lights had surface lead levels from 59 to 70.3 micrograms.  And the Philips lights had surface lead levels ranging from 3.2 micrograms in one string to 107.2 in another. Dr. Leo Trasande, a specialist in children's environmental health at New York's Mount Sinai School of Medicine, said the findings surprised -- and worried -- him. There is no level at which lead exposure is safe," he told CNN. Even at one microgram/deciliter -- the lowest level in a persons blood stream that we can detect -- that level has been associated with cognitive impairment in children. Whats Dr. Trasandes advice to worried consumers? Leave the lights off the Christmas tree. I wouldn't needlessly expose [children] to a lead-based hazard that could have significant lifelong consequences for that childs cognitive capacity or their attention or other health problems, he told CNN. The four companies whose lights were tested by CNN expressed concerns about safety but also defended their products. The special coating around electrical wires on the light sets is necessary to pass the stringent UL safety and quality regulations," Wal-Mart wrote CNN. We are in full compliance with UL regulations which set the standards for electrical coatings. Sylvania told CNN that its lights are tested rigorously for safety and have been used safely by millions of Americans for many years. "Holiday lights are electrical appliances. We encourage consumers to exercise common sense by keeping holiday lights and other electrical products away from the hands and mouths of children," the company wrote CNN. GE told CNN: We can make a fairly obvious common sense observation: Lights are not toys, should not be handled by children, and are not subject to the same standards for lead. The CPSC guidelines you refer to are for products that would regularly be handled by children." Philips said the CPSC swipe test is not a mandated measurement for our industry (it is a test to be applied to children's items and not electrical products). The company, however, told CNN that it takes these matters seriously and is working on technologies to reduce the amount of lead in these products. Meanwhile, CPSC officials criticized CNNs testing methods, saying the swipe test is like comparing apples to oranges and is rotten to the core. CPSC officials also told CNN that Christmas lights do not pose an elevated danger of lead exposure to children. But in previous interviews -- ones conducted with CNN before its tests -- CPSC officials said children should stay away from Christmas tree lights because they are electrical products. 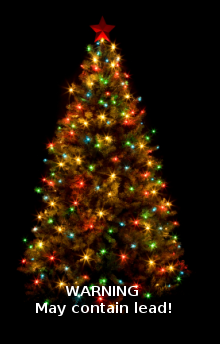 There are plenty of other things kids can do to help decorate the tree," spokeswoman Julie Vallese told CNN. Lights are something that should be the responsibility of the parent. Underwriters Laboratories, which inspects tree lights for electrical and fire hazards, told CNN that calcium and zinc could be used instead of lead in insulation. But those options would be more expensive.